On hearing the news that the French diplomatic maestro Talleyrand had died, the Austrian statesman Prince Metternich is reported to have said “What did he mean by that?” Such is the challenge of interpreting signals in international diplomacy. Parsing the G20 Leaders’ communique from this weekend’s Hamburg summit will keep modern day analysts busy, in particular in the contentious area of trade policy. Contentious? Of course, it wasn’t supposed to be like this. 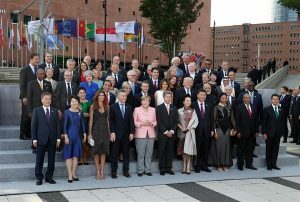 Early on in the global economic crisis G20 Leaders, claiming to have learned the lessons of the 1930s, committed to a no-protectionism pledge. Despite repeating and extending the pledge, since November 2008, G20 governments have tilted the playing field a total of 5,886 times in favour of domestic interests. On average, the G20 no-protectionism pledge has been broken every 13 hours since it was agreed at the first G20 Leaders summit in Washington DC. The violations of the no-protectionism pledge didn’t worry many officials because every G20 government was breaking the pledge and, as the saying goes, people who live in glass houses don’t throw stones. The reality is that many G20 governments quietly demoted open borders to pursue other policy objectives. So as to obscure this reality, a diplomatic fiction was created that protectionism had been contained. We, the guileless, were supposed to believe that somehow non-binding G20 summit declarations were enough, although no explanation of how this worked was ever provided. (If this were the case, why bother with binding multilateral trade rules?) Trade diplomats in Geneva convinced themselves that the multilateral trading system had worked and that the protectionist “dog didn’t bark,” as one WTO ambassador from a G20 member recently recounted to me. When the electorate of one major G20 member decided to elect a head of state that was clearly dissatisfied with the trade policy status quo the game was up. Convinced that unfair trading practices by other nations had cost American jobs and shut down factories, President Trump adopted an “America First” policy. As far as the G20 was concerned, it is impossible to reconcile President Trump’s grievances on trade with the G20’s diplomatic fiction on protectionism. Either lots of protectionism happened or it didn’t. Precisely because the G20 pledge has been broken so often, the Global Trade Alert team has been able to document a total of 1,883 policy initiatives by other G20 governments that harmed US commercial interests were still in force at the end of 2016. Should the Trump Administration go looking for evidence of foreign unfair trading practices, they will find it. The risk, then, is that the G20’s protectionist chickens will come home to roost. Given this context, in the run up to the Hamburg summit no wonder trade policy discussions became much more fractious. Despite undertaking plenty of protectionist acts of their own, many G20 members tried painting the US as a rogue trading nation. This was seen as hypocrisy by certain officials in Washington DC, such as Wilbur Ross, the US Secretary of Commerce who denounced complaints about US protectionism as “rubbish.” In fact, together US Federal and state governments have implemented 1,195 beggar-thy-neighbour acts since November 2008, more than any other G20 member. Truth is the first casualty of war—and it would seem diplomacy. So what was decided in Hamburg? And at what price? Before getting into the details, it is worth recalling two points. First, all the G20 had to do at Hamburg was agree on some text on protectionism. That text need not be elegant. It need not be constrained by logic. And, of course, the text—like its predecessors—need not be adhered to. That is, no G20 member would be forced to change anything as a result. Quite frankly, then, the bar set was not that high. Still, such text does send a signal of sorts and that is worth thinking about. Second, whatever text is agreed on protectionism may be read in a number of different ways. Worse, what may be understood by the negotiators of a text may not be at all evident from what is written. The text on protectionism in the first G20 Leaders Summit communiqué is a case in point. One senior trade official heavily involved in the negotiation of that text told me that it was understood then that the no-protectionism pledge did not cover anti-dumping actions, even though there was no way to discern that from the text. So analysts have to be aware that the contents of any G20 text may have little bearing on what the officials who negotiated that text understood it meant. The Hangzhou statement extended the standstill and rollback of protectionism until the end of 2018. No such statement was made in the Hamburg text. Arguably it was unnecessary (this being 2017 not 2018) but it does raise the interesting question as to whether there will be enough support among G20 governments next year to extend the standstill and rollback commitment. The first sentence of the Hamburg text arguably contains something for everyone—notwithstanding its possible incoherence. American officials will likely value the statement about unfair trading practices and the carve out for trade defence instruments. Other G20 members will be happy to see that specific mention of protectionism was not dropped and that non-discrimination was included. They may not have been so keen to see trade and investment rules referred to using the weaker term “frameworks.” Still, in other parts of the Hamburg declaration statements supportive of the WTO were made. However, much will depend on how elastic is the definition of trade defence instruments. The conventional interpretation is that it includes anti-dumping and countervailing (anti-subsidy) actions. But could the definition be stretched over time to include safeguard actions and actions justified on the grounds of national defence or national security? The latter question is important given the section 232 investigation underway in the United States into the alleged threat posed by foreign steel to national security. The phrase “continue to fight protectionism including all unfair trade practices” will cause some to scratch their heads. Are all unfair trade practices a form of protectionism? If so why, other than for public relations reasons, mention unfair trade practices? Or was it wrong to use the word “including” and the intent was that unfair trading practices involve certain policy interventions that are not deemed to be protectionism? If the latter, then arguably the G20 non-protectionism pledge has expanded in scope. Again, there is a risk of reading too much into what is an ugly, contorted sentence. The last sentence of the Hamburg text, that relates to a level playing field in trade and investment policy, sustains the priority given to investment policy in the Hangzhou text, thereby not undoing one of the accomplishments that Chinese trade officials are proud of. Still, one detects a weakening in the Hamburg statement—a shift from a wide-ranging statement opposing all investment protectionism to the much more ambiguous formulation concerning a “level playing field” and “favourable environment” for investment. This weakening should be seen in light of recent French and other European proposals for screening of non-EU mergers and acquisitions, thought to target Chinese transactions. In sum, that a text on protectionism was agreed at Hamburg is—compared to the alternative—encouraging. But at what price? Increased ambiguity concerning the range of undesired policy interventions, carte blanche on trade defence, and equivocation over the treatment of foreign direct investment seem to be the answer. We recognize that excess capacity in steel and other industries is a global issue which requires collective responses. We also recognize that subsidies and other types of support from government or government-sponsored institutions can cause market distortions and contribute to global excess capacity and therefore require attention. We commit to enhance communication and cooperation, and take effective steps to address the challenges so as to enhance market function and encourage adjustment. Recognising the sustained negative impacts on domestic production, trade and workers due to excess capacity in industrial sectors, we commit to further strengthening our cooperation to find collective solutions to tackle this global challenge. We urgently call for the removal of market-distorting subsidies and other types of support by governments and related entities. Each of us commits to take the necessary actions to deliver the collective solutions that foster a truly level playing field. 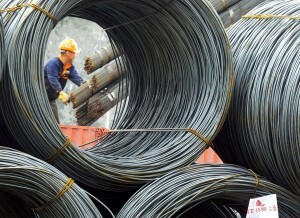 Therefore, we call on the members of the Global Forum on Steel Excess Capacity, facilitated by the OECD, as mandated by the Hangzhou Summit, to fulfil their commitments on enhancing information sharing and cooperation by August 2017, and to rapidly develop concrete policy solutions that reduce steel excess capacity. We look forward to a substantive report with concrete policy solutions by November 2017, as a basis for tangible and swift policy action, and follow-up progress reporting in 2018. The Hangzhou text notes that subsidies can cause market distortions whereas the Hamburg text for the urgent removal of market-distorting subsidies. The Hamburg text defines both specific steps and a timetable for G20 members to address excess capacity in the steel sector before the end of this year. All of these observations support the contention that tackling global industrial overcapacity is one message the G20 wanted to send at the Hamburg summit. Arguably, the language in the Hamburg text on excess capacities, in particular as it relates to steel, is more specific than that relating to protectionism. Even so, it is unclear clear what actions governments are expected to take. It may not be possible to reverse in a straightforward manner a bailout or a cash-injection given to a steel mill five years ago, for example. Are bailout beneficiaries expected to repay all state funds received? What if a firm cannot make such a payment without going bankrupt? What if the state aid is in the form of guarantees and no cash changed hands? Are G20 governments expected to encourage the consolidation of firms in sectors with excess capacity? Will that result in more “picking winners” industrial policy? Or, is the intention to encourage mutual withdrawal of financial and other support by G20 governments to firms in sectors with overcapacity? Critical details are missing generating, amongst others, more political risk for firms in sectors with overcapacity. Given fears that the G20 Leaders would be unable to agree some text on protectionism and the adverse signal that would have sent to firms and governments around the world, then the Hamburg summit outcome is to be welcomed. However, any relief will be tempered by assessments as to whether G20 texts on protectionism have much bite in the first place. On that, there is plenty of grounds for scepticism. The price paid to reach consensus at Hamburg was not trivial, at least as far as the text is concerned (and who knows what unpublished side deals were made.) The price includes greater ambiguity concerning the scope of undesired protectionism, carte blanche on the use of trade defence instruments, and potentially worse treatment of foreign direct investment, in particular cross-border mergers and acquisitions. However, where the G20 firmed up its language was on tackling excess capacity, especially in the steel sector. For sure, important details need to be determined, but over time this step could assume greater significance. Although G20 officials in Hamburg may not have conceived of the matter in these terms, over time the G20 may come to recognise that, while it cannot hope to stem the flow of protectionism, steps can be taken to unwind major trade distortions affecting the world trading system. Moreover, approaching such matters sector by sector might make sense under some circumstances. Just as central bankers used to debate whether it made more sense to prick nascent financial bubbles or wait and clear up the mess after a bubble bursts, the G20 could find itself choosing between preventing or remediating protectionism. A debate in those terms—prevention or cure?—might be worth having and the seeds of that debate may have been (inadvertently?) planted in Hamburg. Their talk and writing is nothing but fighting over who makes and pops artificial bubbles. Bunch of artificial bubbleheads themselves. The real world is of no importance to them. While the Earth itself is dying…. Simon J. Evenett is Professor of International Trade and Economic Development, University of St. Gallen, and Coordinator, Global Trade Alert.